Stir Bisquick™, milk, eggs, and dark chocolate chunks together until blended. Pour by slightly less than 1/4 cupfuls onto hot griddle. Cook until edges are dry. Turn; cook until golden. Note: If you like thin pancakes, use 1 1/2 cups milk. Serve pancakes topped with syrup, with a dollop of fresh whipping cream. 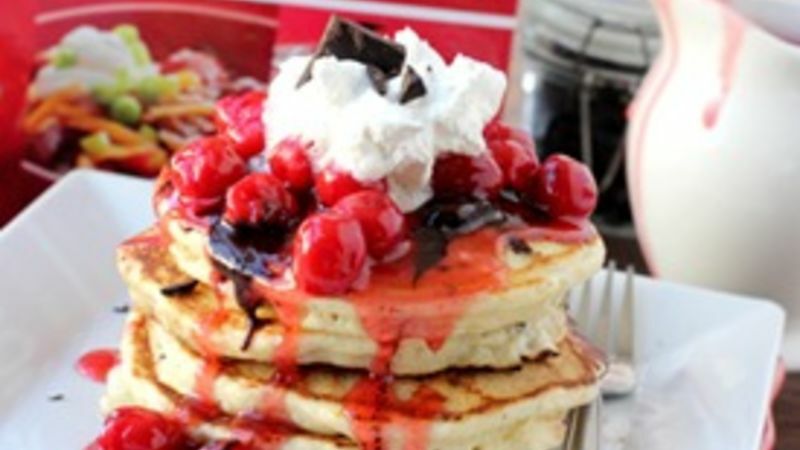 Today's twist: Chocolate-Chunk Pancakes with Ginger-Cherry Syrup, CheekyKitchen's version of Betty's Pancakes recipe. Also today: check out Smwise's Morning Glory Pancakes over on Taste for Adventure! "Saturday Morning Pancakes" isn't just a great phrase -- it's a great idea. Whether you're cooking for a crowd this weekend, or just for your little old lonesome, this gourmet twist on classic pancakes is simple divine. Chocolate Chunk Pancakes with Ginger Cherry Sryup -- picture it -- dark chocolate chunks smooch themselves all over a classic, fluffy batter, then get topped with a tart cherry syrup that is to-die-for delish. Ready to get cooking? What are you waiting for?! Friday Morning Pancakes are just as delicious. And don't miss Tuesday Morning Pancakes, Wednesday Afternoon Pancakes, and Monday Night Football Game Pancakes. Hello yum. To make this haute version, just whip up a classic batch of Betty Crocker pancakes. Wherever can you find Betty's brilliantly beautiful, pleasantly perfect, totally amazing pancakes? Why, in the new Big Red Cookbook, which was just released by all your favorite folks at the Betty Crocker kitchens. It's chock full of gorgeous pictures and great new recipes, as well as a few of your favorite classic recipes. Like this awe.some pancake batter. There's not a better recipe out there. Toss a bunch of fresh-chopped dark chocolate chunks into your batter. Yes. Chocolate. Dark chocolate. In batter. I know. Scoop your batter and cook it right up, the way you normally would. Don't forget to give a nice coat of nonstick cooking spray to your grill pan to ensure easy flipping action. Whilst your pancakes cook, boil a bit of sugar and water on your stove. Then toss ground ginger and a bag of frozen tart cherries into your pot. If you forgot to run to the store to get said frozen tart cherries, you can also use a can of pie filling. I prefer the frozen tart cherries for their gorgeous burgundy color and naturally sweet flavor. But, darlin. Whatever floats your boat. The only thing left on this Saturday morning (or Tuesday mid-noon, or Thursday midnight) is to put your pancakes together. Stack 'em up, syrup up, and grab a fork. Happy pancake everything! Are you a fan of the choco-cherry combo?